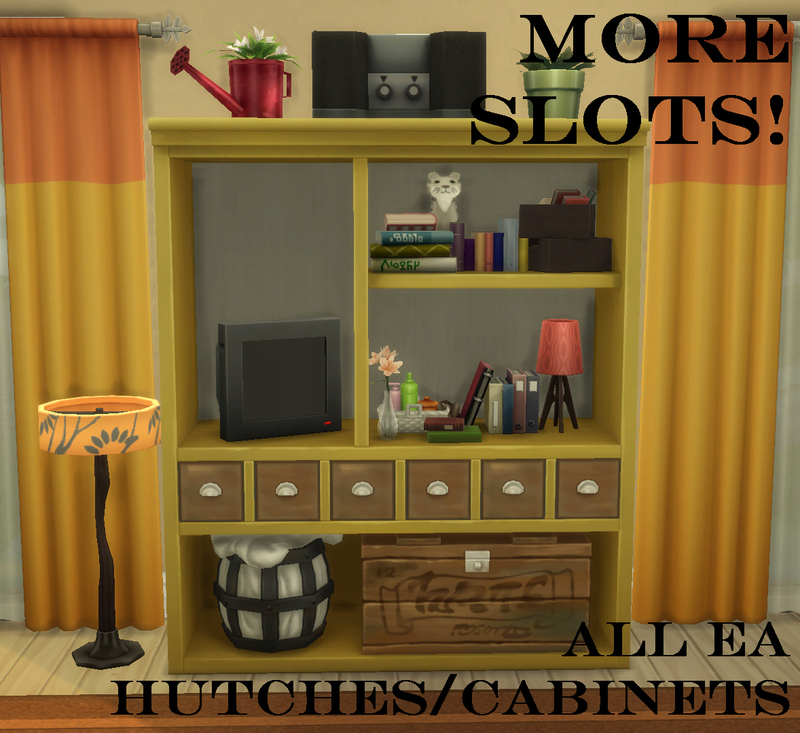 So here is another "more slots" mod I made for the EA Hutch/Cabinets. So what does this mod do exactly? 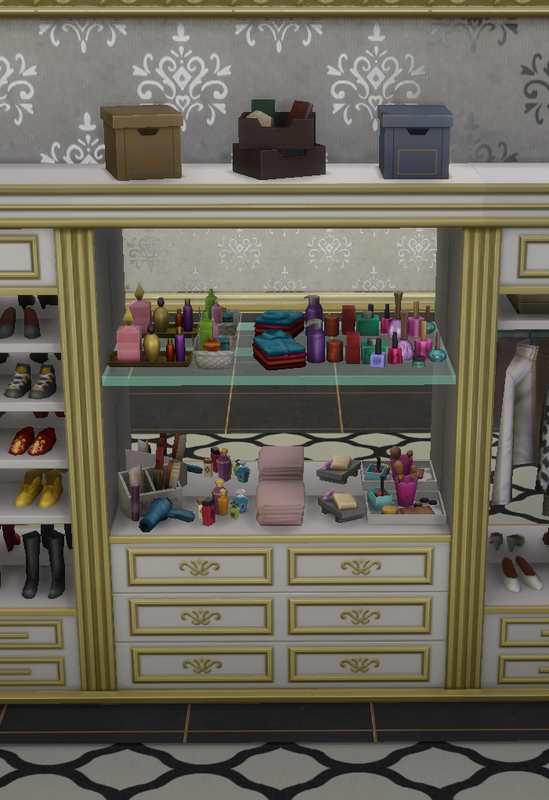 This mod adds additional decorative slots on each and every one of EA's Hutch/Cabinet Displays. -Each decor/clutter item is categorized into small-medium-large sizes. -Every surface inside the game (tables/shelves/counters etc.) has slots on them. -BIG TV's can be placed on a "special" slot, while stereos and SMALL TV's can be placed on "large" slots. I added a couple more small and medium slots for a bit more flexibility when placing objects. 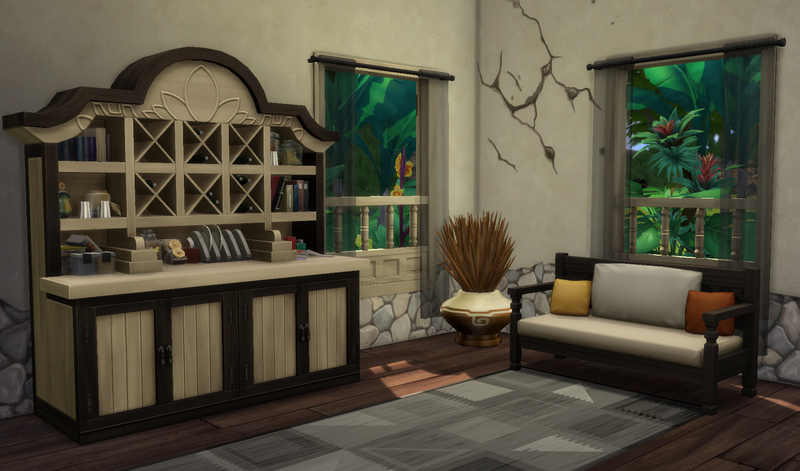 Some hutches have very limited space so, there might be some clipping issues depending on how large the item you are trying to place is. You can always try resizing the item using the [ ] keys. There are multiple flavors for those that don't have the required packs. Pick the MERGED flavor ONLY if you have all the specified packs! If you don't, pick and choose the ones you have and download them seperately. !! 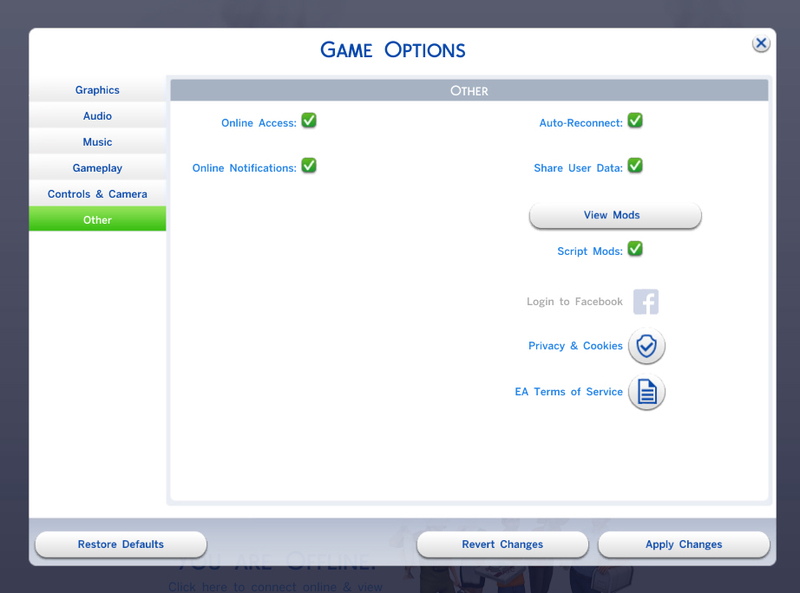 !This mod overrides AND will conflict with any mod using the following resources!!! MERGED - Hutch Slots Fixed.rar | Description: Contains all the Hutch/Cabinets --- !ALL SPECIFIED PACKS REQUIRED! 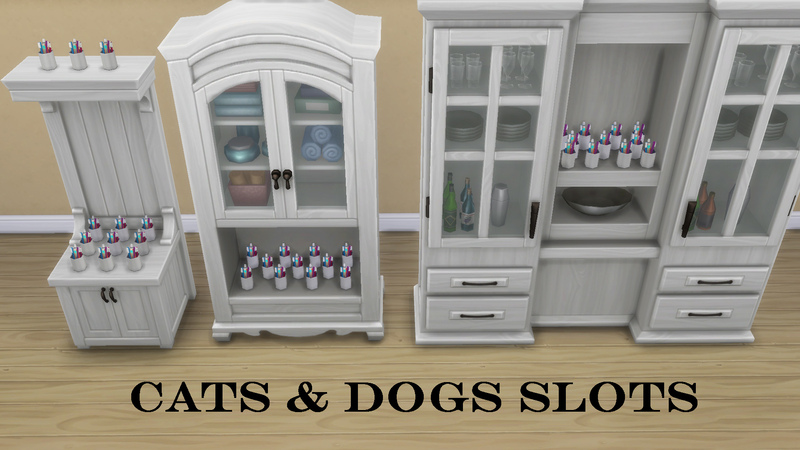 CATS & DOGS - Hutch Slots Fixed.rar | Description: Contains the Cats &amp; Dogs Hutch/Cabinets ONLY --- !CATS &amp; DOGS REQUIRED! 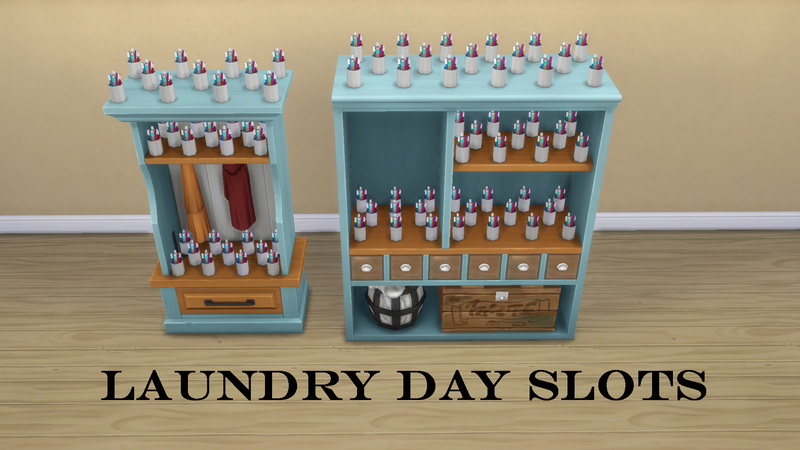 LAUNDRY DAY - Hutch Slots Fixed.rar | Description: Contains the Laundry Day Stuff Hutch/Cabinets ONLY --- !LAUNDRY DAY STUFF REQUIRED! 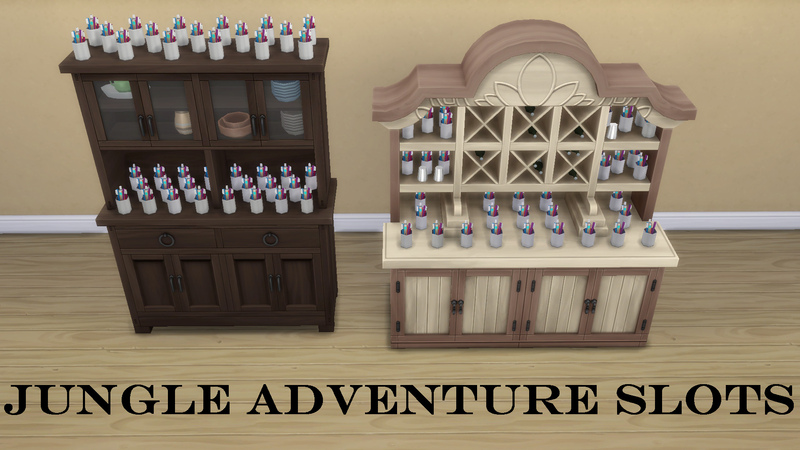 JUNGLE ADVENTURE - Hutch Slots Fixed.rar | Description: Contains the Jungle Adventure Hutch/Cabinets ONLY --- !JUNGLE ADVENTURE REQUIRED! 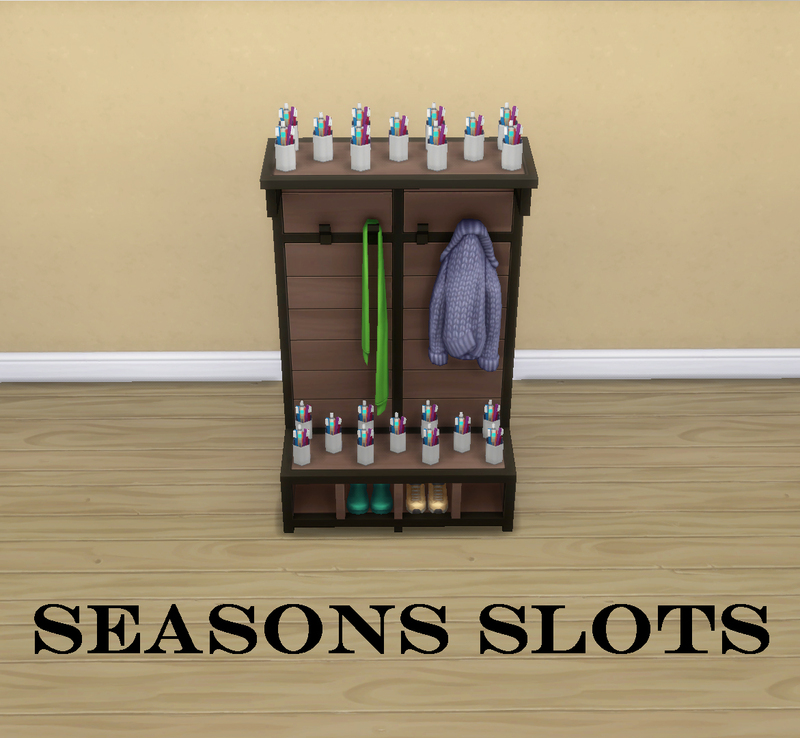 SEASONS - Hutch Slots Fixed.rar | Description: Contains the Seasons Hutch ONLY --- !SEASONS REQUIRED! 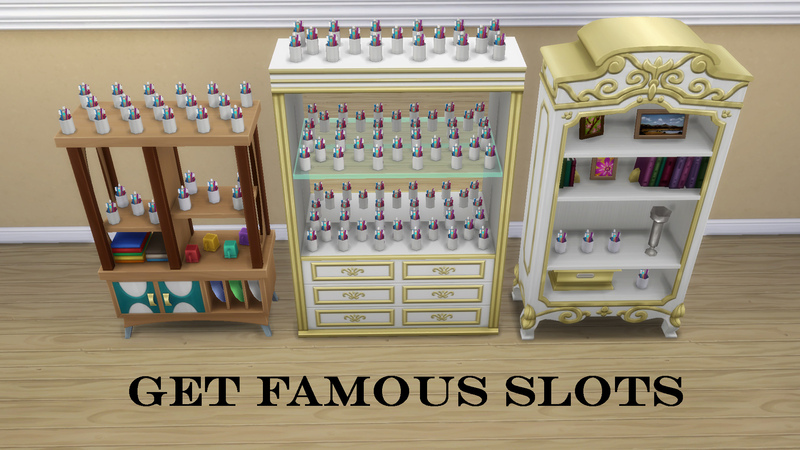 GET FAMOUS - Hutch Slots Fixed.rar | Description: Contains the Get Famous Hutch/Cabinets ONLY --- !GET FAMOUS REQUIRED!